On May 3, 2018 local time, Chairman of the Workers’ Party of Korea (WPK) and Chairman of the State Affairs Commission of the Democratic People’s Republic of Korea (DPRK) Kim Jong-un met at the headquarters of the WPK Central Committee with State Councilor and Foreign Minister Wang Yi, who was visiting the DPRK. Wang Yi first conveyed President Xi Jinping’s warm greetings to Chairman Kim Jong-un. Wang Yi expressed that not long ago, Comrade Chairman successfully visited China, and General Secretary Xi Jinping and Comrade Chairman held a historic meeting. They reached a series of important consensus, which opened a new chapter of China-DPRK relations as well as jointly planned and led China-DPRK relations to enter a new development stage. My visit this time aims to well conduct and effectively implement the affairs agreed by the top leaders of the two countries. 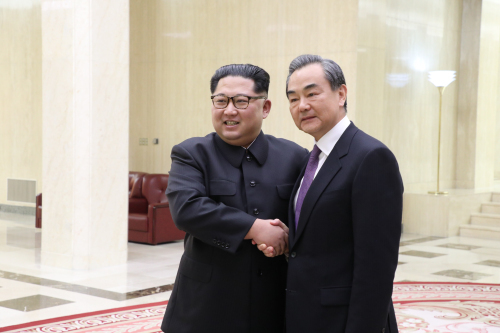 Wang Yi stated that the DPRK observed the situation, made decisions resolutely, and guided positive changes in the Korean Peninsula situation. China supports and congratulates the leaders of the DPRK and the Republic of Korea on a successful meeting and on issuing the epoch-making Panmunjom Declaration. 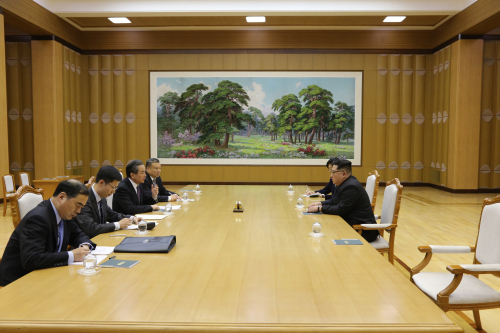 The meeting brought favorable opportunities for the political settlement of the Korean Peninsula issue. China supports an end to the state of war on the Korean Peninsula and the realization of the replacement of the armistice with a peace agreement, supports the DPRK in shifting its strategic focus to economic development and supports the DPRK in resolving its own legitimate security concerns while advancing the process of the denuclearization. China is willing to maintain communication and strengthen coordination with the DPRK in this regard. Kim Jong-un asked Wang Yi to convey his warm greetings to President Xi Jinping. Kim Jong-un stated that the DPRK-China friendship is a legacy left by the elder generations of leaders of the two countries and it is valuable and precious. To consolidate and develop friendly cooperation between the DPRK and China is an unswerving strategic policy of the DPRK. Not long ago, Kim Jong-un made a historic visit to China and had extensive and in-depth exchanges with President Xi Jinping. Both sides reached important consensus and achieved fruitful results. The DPRK is willing to work with China to push the DPRK-China friendly relations to new and higher stages. The DPRK speaks highly of China’s positive contributions to the peace and stability of the Korean Peninsula and is willing to strengthen strategic communication with China. Kim Jong-un said that the DPRK stands firm on the denuclearization of the Korean Peninsula. 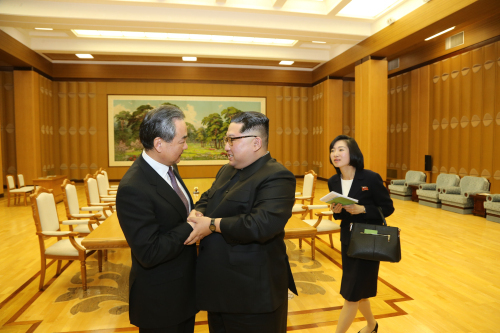 For a period of time, the positive changes in the Korean Peninsula situation are meaningful and conducive to the peaceful resolution of the Korean Peninsula issue. The DPRK is willing to establish mutual trust and discuss eliminating the roots that threaten the peace of the Korean Peninsula by resuming dialogue. At the invitation of Foreign Minister Ri Yong-ho of the DPRK, Wang Yi visited the DPRK from May 2 to 3. During the visit, Wang Yi held talks with Ri Yong-ho.